A Purdue University nuclear engineering student has turned his time-consuming hobby into something new under the sun an electric drive train that turns almost any skateboard into a high-speed magic carpet ride. Joe Carabetta of Lake Zurich, Ill., wanted a kick-free ride on his favorite board without having to purchase a more expensive, clumsy board with a built-in motor. 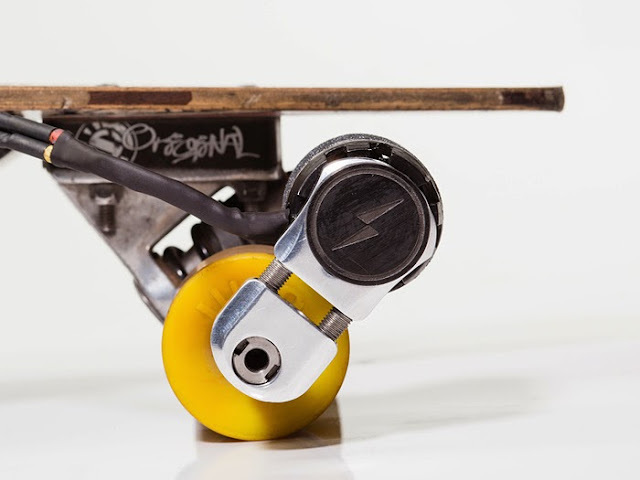 His "Kickr" can be easily and quickly strapped on and off almost any skateboard, letting him motorize his entire collection with just one device. Carabetta also did not like very uncool hand control cables on motorized boards. His motor is controlled by foot with a subtle, pressure-sensitive sensor on the board's surface. "The first time I stepped on this board it far exceeded my every expectation," said Carabetta. "It's like flying without wings." The system currently reaches speeds of at least 20 mph, can travel uphill and has a range of several miles. That makes it both fun for boarders and useful as a no-impact, environmentally sound commuting machine for those without the skill, quadriceps, calves or motivation for kicking. After some favorable publicity this summer, Carabetta went online for broad-based, crowd-sourced investment. He quickly doubled his investment goal. With the motto "Electrify Every Longboard!" he's now taking customer orders. Kickr's drivetrain is made possible in part because of Carabetta's access to Purdue's high-tech Artisan and Fabrication Lab that was recently opened to student entrepreneurs so they can easily and affordably craft prototypes of their products. Kickr's drive train is crafted by computer-controlled tools from stainless steel and aircraft-grade aluminum.